This past week, we spent time away from our families, jobs and communities to meet with decision-makers in Washington, D.C. regarding a place of sacred importance to many tribal nations: the greater Chaco landscape of northwest New Mexico. We journeyed over 2,000 miles because pieces of our history, culture and future are being threatened by intensive fossil fuel energy development that is spreading across our ancient homelands. The greater Chaco landscape is one of the richest cultural landscapes in the United States. It is the ancestral home of our Pueblo people. The Chaco Canyon, Mesa Verde, and Bears Ears regions of the Four Corners are what we call the “footprints of our ancestors” as we trace our ancient migration. They record the long-living history of Pueblo people in the southwest United States. Chaco Canyon has been home to the Pueblo people for thousands of years. Currently, only a small area of our ancestral homeland is protected as the Chaco Canyon National and Historic Park. Most of the publicly-managed lands in the region are unprotected and exposed to industrial development. Sadly, more than 90 percent of public land in the area is already leased for oil and gas drilling. The remaining land — home to thousands of artifacts, ancient houses and roads — is at risk of being damaged by new drill pads, pipelines and a web of industrial access roads. We, the direct descendants of the ancestral Chacoan people hold various leadership roles in our respective communities and represent thousands of Pueblo people. The integrity and health of our land is of paramount importance to us. During our Washington trip, we shared our stories with the current administration and Congress. And we have called on Interior Secretary Ryan Zinke and the entire federal government to protect what little remains of this landscape. Our trip follows two historic meetings over the past two years between the Navajo Nation and Pueblo governors in New Mexico. Tribes throughout the southwest recognized that the threat to this sacred and important landscape was so great that we joined together in our efforts to save our sacred sites. Our trip also comes as the Bureau of Land Management prepares to release a plan that could alter our cultural landscape forever. The BLM and Bureau of Indian Affairs are revising a land-use plan for the region that will decide whether the core area around the park, defined roughly by a 10-mile radius, will be open to drilling. New technologies in accessing oil and gas reserves have led to increased development interest in the greater Chaco landscape. It is imperative that the current administration and members of Congress understand what is at stake should the United States government continue to develop in the region. Thankfully, legislation has been introduced that would safeguard some of the lands within the core area outside of the park. 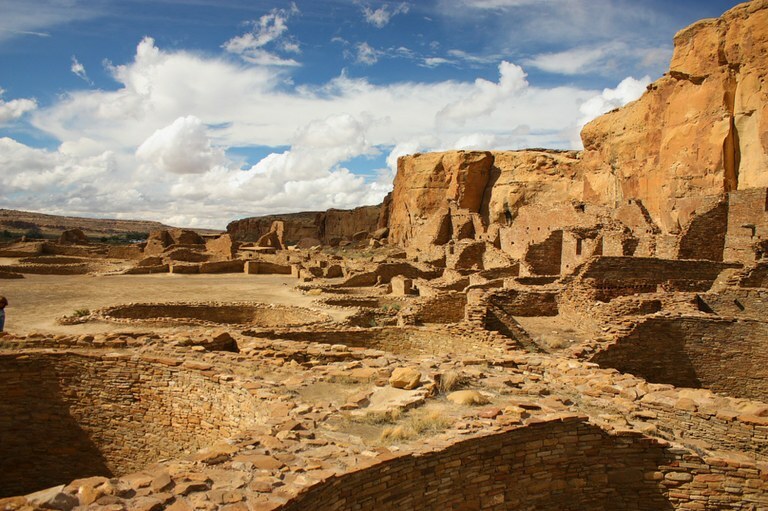 The bill, the Chaco Cultural Heritage Area Protection Act of 2018, is supported by the All Pueblo Council of Governors and the Navajo Nation. Whether it is through the BLM and BIA management plan, the proposed federal legislation, or both, we want decision makers in D.C. to know that just as the United States takes great care to preserve churches, we would hope they would do the same for our sacred places. Chaco Canyon is, and always will be, a part of who we are. It is where our ancestors lived and where they continue to reside and it should be preserved for future generations. 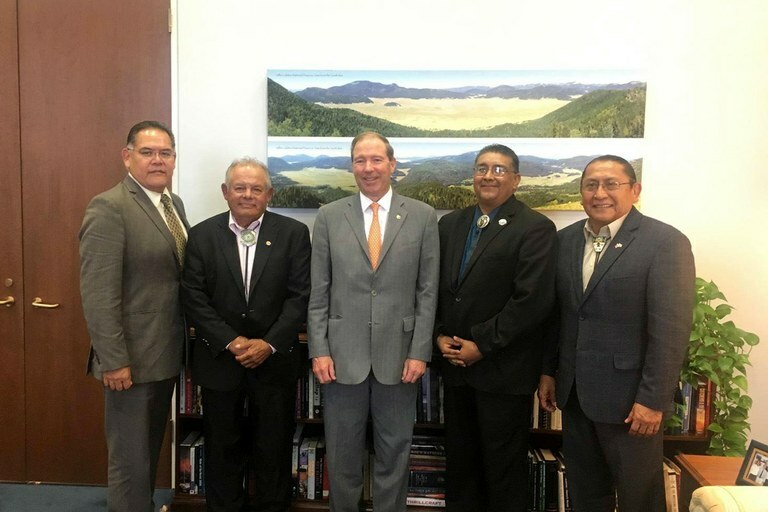 From left, Former Pueblo of Tesuque Governor Mark Mitchell, All Pueblo Council of Governors (APCG) Chairman Edward Paul Torres, New Mexico Senator Tom Udall, APCG Vice-Chairman and Pueblo of Santa Clara Governor J. Michael Chavarria, and Pueblo of Acoma Governor Kurt Riley are pictured at a meeting with the New Mexico senator. Submitted by the All Pueblo Council of Governors (APCG) Chairman Edward Paul Torres, APCG Vice-Chairman and Pueblo of Santa Clara Governor J. Michael Chavarria, Pueblo of Acoma Governor Kurt Riley, and former Pueblo of Tesuque Governor Mark Mitchell who share the responsibility of Co-Chairs for the APCG Natural Resources Committee.